With Paris Haute Couture Week 2019 in full swing I find myself reminiscing of my first experience in the industry under the guidance of Suzie Turner. What a way to enter the fashion realm. An inspiring London atelier where we spent our days around a table hand embellishing Swarovksi crystals onto the finest cream French lace. It took me two 8 hour work days to learn the standard on a scrap piece of fabric before being allowed to touch the real deal. Fast forward some years and in between I have picked up a deep understanding and passion about promoting sustainability within the fashion community, inspired to always strive for a less wasteful process in the sewing room. This scrap busting idea is the first of many whirring around my brain, all of which will forever be free content to encourage a more mindful approach to your sewing projects. Let me know what you think in the comments and be sure to familiarise yourself with the first #DPLCHALLENGE at the bottom of this post. Scrap fabric from any given project, for the purpose of my design I have used leftover crepe from my Asymmetric Culottes. In this example I have used a scrap 21cm in length and 2.5cm in width. Do note, the thread is intended to be a continuous length and should only be snipped where directed. The work will be secured as we go with double knotting. 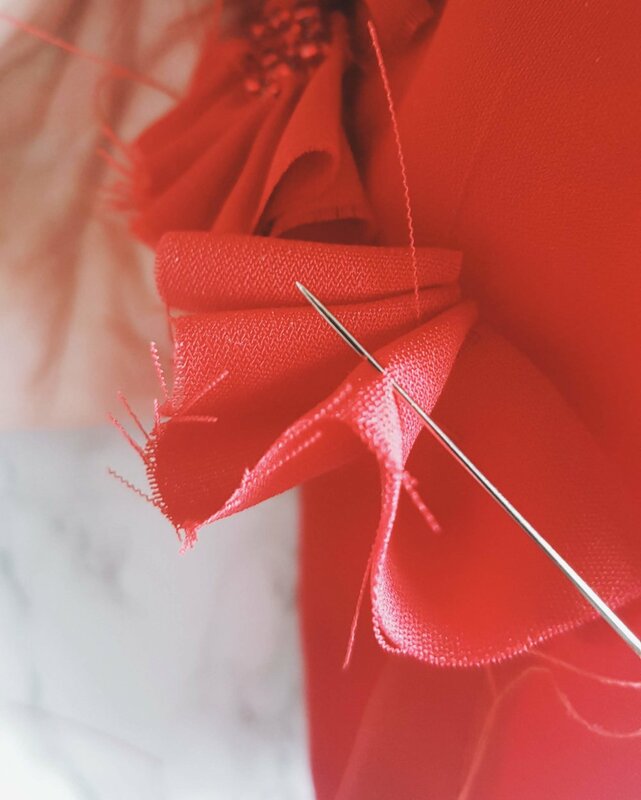 Start by waxing your thread with the beeswax, drag it through no more than two times and ensure you pull your nail down the length before threading your needle. This not only removes excess wax and protects your fabric but simultaneously untwists the thread to maximise avoiding knots and tangles. We use beeswax to condition and strengthen the thread whilst ensuring hand sewing runs as smoothly as possible. Starting in at 1cm from the edge of your scrap, anchor your thread. To do this, push your needle through a few fibres of the fabric and back stitch over them once before repeating the motion twice, tying a knot each time. This can be fiddly but ensure your stitch lengths are kept to a minimum. Next, fold over the end by 0.5cm and pick up a couple of fibres with your needle on the fold, if you find pressing the cloth as you go easier feel free to do this with care. Gently pull your thread through before working in line with your anchor and picking up two or so fibres from the bottom. Repeat this process in a slight zig-zag across the length of the 2.5cm edge making sure to pull your thread gently so it lies flat on the cloth. Now the fun bit: pull your thread through to achieve your rolled hem. Once you have created the first rolled hem, push your needle through to the other side of your work and flip the scrap over. Now, sew a long running stitch down the length of your fabric piece ensuring whichever lengths you take are equal, here I have done about 1.5cm stitches, 0.5cm in from the edge. Gently pull on the thread to gather the length into your petal formations, you will have a small tail left at the end. If needed, flip your work and repeat the process to roll the hem on this edge. Both hems should face the same way. 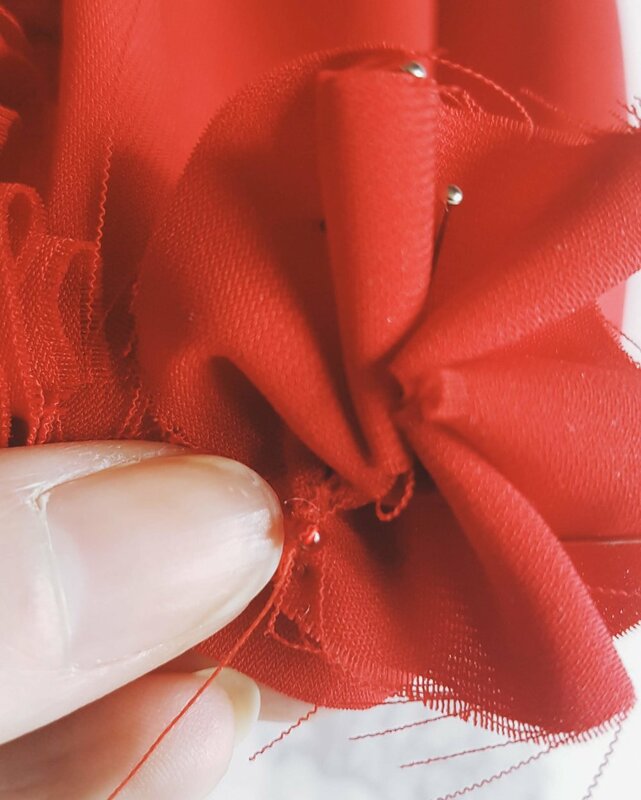 At this stage you can gently ‘tweak’ the ease in your embellishment to arrange the petals in a manner you like before joining the two hemmed edges together. Catch the opposing end with your needle and gently pull until the shape becomes an enclosed circle. 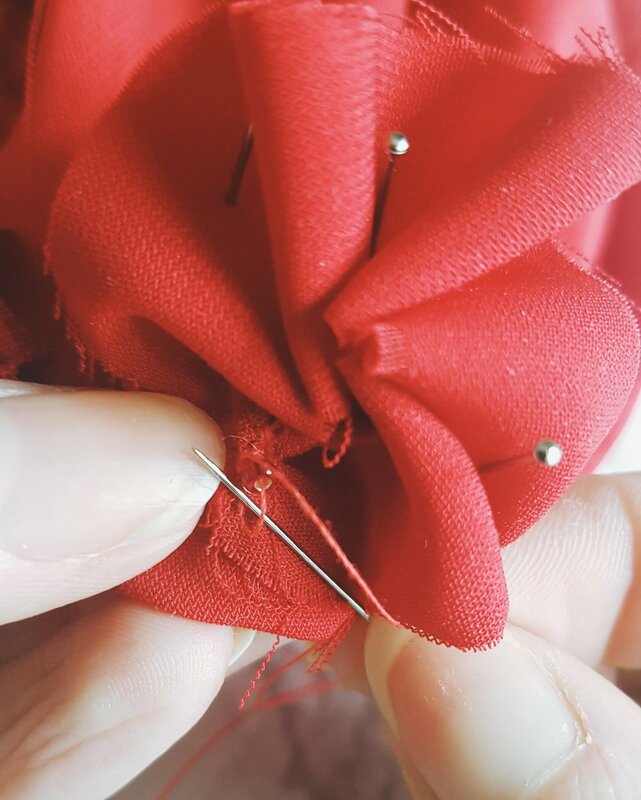 take care to adjust your ease and arrange your petal formation as you see fit, we will then secure the shape by stitching up the meeting ends and double knotting in place. In addition to exquisite stitching quality, haute couture involves painstaking attention to detail resulting in durable, neat garments. When attaching to your work, take care to pick up only a couple of fibres at a time (as we did with the rolled hem) to ensure the stitching is neat on the wrong side of the garment as shown (middle image) - take note of your tension and do not pull the thread too tight or puckering may occur, or worse - a snag in your garment! This not only takes practice but patience, however the results are flawless. 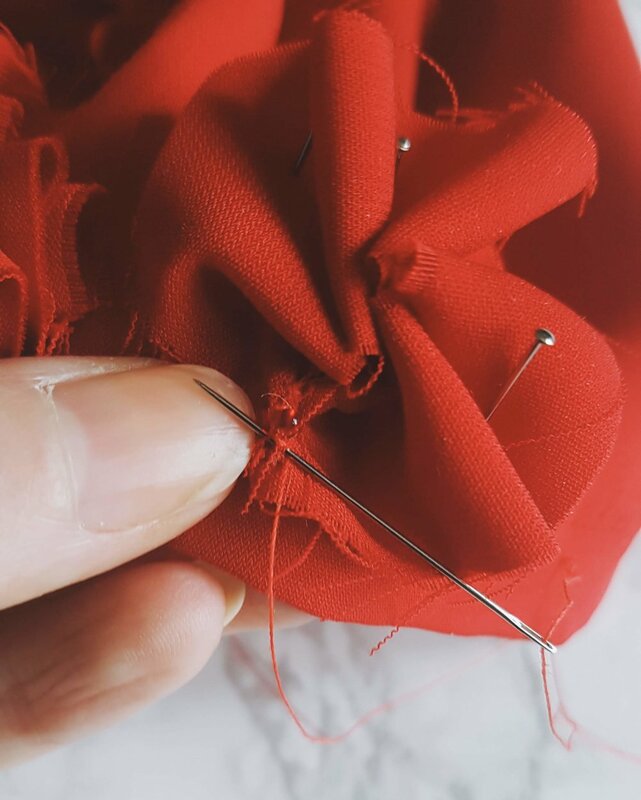 beginner tip: You could work your pieces onto the hem and side seams, using the bulk of the fabric on these areas to hide your stitching details. 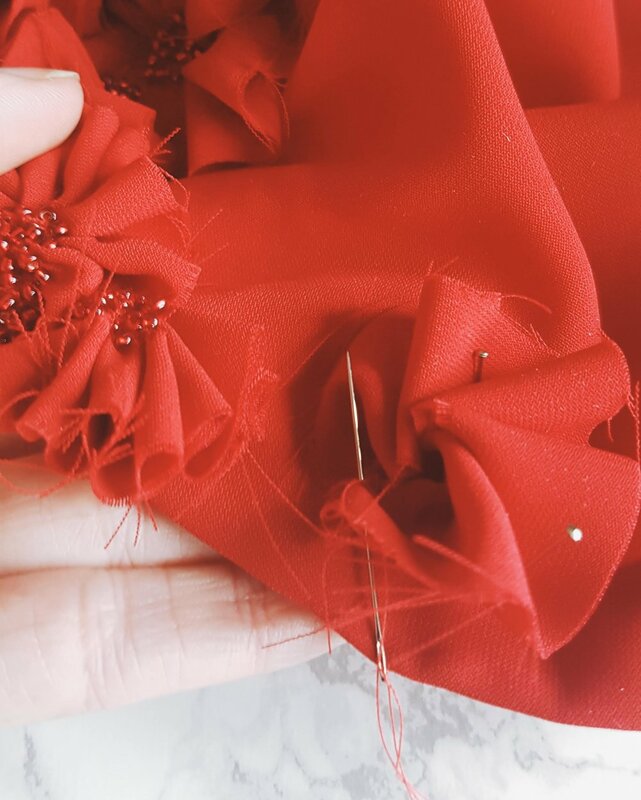 Lay your embellishment on the desired area of your garment, your thread should still be attached after double knotting the petals closed in their circular shape. You should still be able to gently manipulate the shape by easing the fabric along the thread. Once happy with silhouette and placement gently ‘tack’ the piece down by vertically inserting pins. 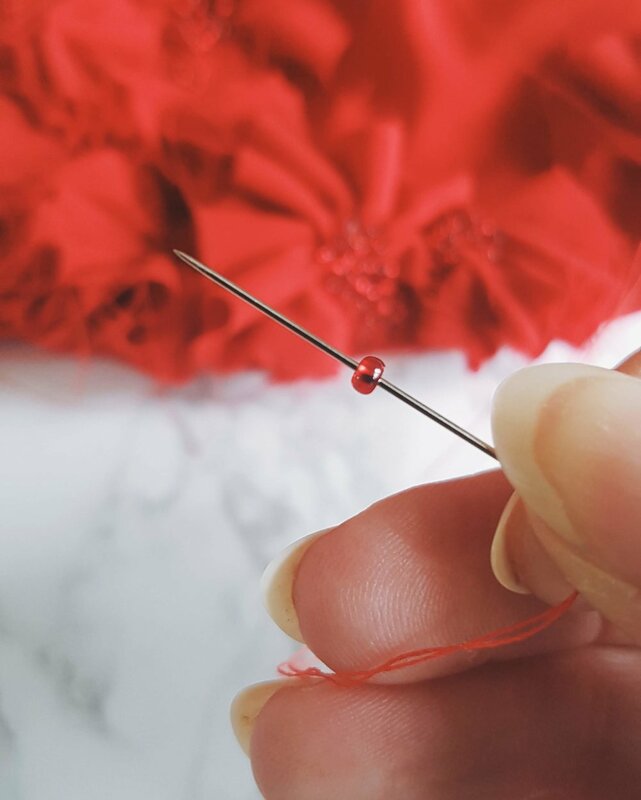 Ensure the pins are the appropriate size for your chosen fabric and won’t taint the cloth once removed. If you’d prefer to rebel and go a little freehand, simply place your embellishment wherever you desire and anchor it immediately with a stitch. It is integral when beading to double knot and secure each individual bead, this way, should one fall off, it won’t unleash a chain reaction and send the remaining cluster flying. 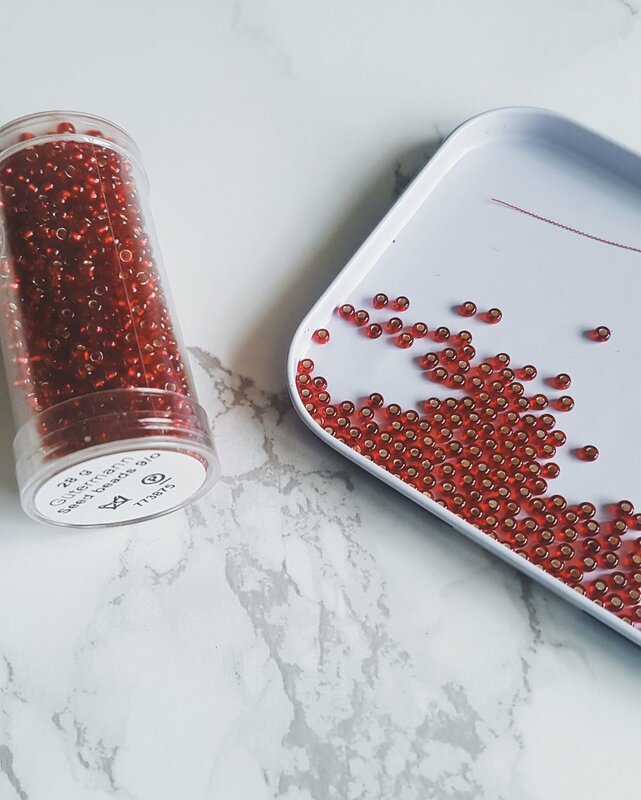 In this process the beads will also be used to further secure the ‘flower’ - start at the centre of the base and slip each bead onto the needle individually, securing in place with a knot. Ensure the holes to the bead are facing sideways and the bead is lying flat when pulled tight and sewn in place for a clean aesthetic. Repeat the process using as many beads as desired and look to catch the edges of the ruffled scrap fabric in place whilst doing so. You may find the petals of your embellishment need securing down and seem to ‘flop’ over. 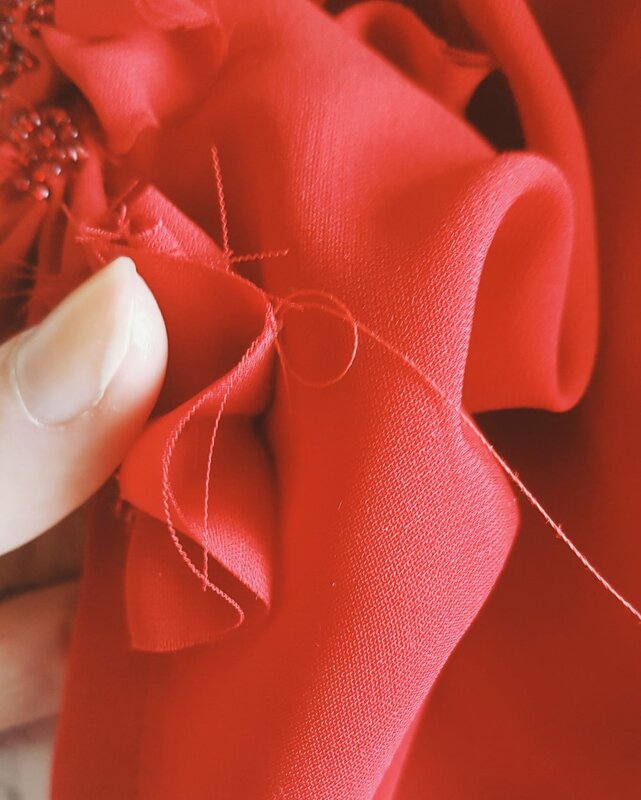 Simply continue your line of thread and using the technique, sew between the valley fold of your petals and once more select a couple of fibres, sew the embellishment to the garment in the desired areas, making sure to double knot. You can now trim your thread! It is up to you how many you wish to add, to be truly zero waste you could continue until your scraps have been used up, or alternatively add a delicate handful to enhance your design. There is no time like the present to launch our first challenge! If you accept you may be in with a chance of winning our upcoming pattern and the entire range of Fashion File packs thus far - so we challenge you to apply this tutorial to any make you desire! It doesn’t have to be a Digital Pattern Library design but it DOES need to incorporate your scraps or off-cuts in an innovative appliquéd way. Points are awarded for creativity and attention to detail in the spirit of haute couture. Please be encouraged to experiment with widths, shapes and lengths of your scrap fabric to produce exciting results. As you can see, I left the long edges of my crepe raw as I felt this gave the finished look another dimension and kept in line with the zero waste ethos, however, if you’d prefer to you could try using pinking shears to experiment with a different finish or even stitch near the edge of your lengths to prevent severe fraying over time. The world is your playground and I look forward to what you can create, the focus is to use your scraps and enhance your makes in a couture and bespoke way. This challenge will run until March 1st 2019. Use the hashtag #DPLCHALLENGE throughout social media and tag us in your posts so we can get inspired and select some winners - have fun and happy sewing!